This affordable hand crank sewing machine is an economical alternative to electric powered sewing machines for saddle makers, leather workers and manufacturers of harnesses. The OUTLAW leather hand crank stitcher is a hand-powered leather sewing machine capable of sewing up to 3/4 inch thick leather, as well as nylon, canvas, urethane, plastic, sheepskin, webbing, beta, biothane, and the like. No need for cords, outlets or motors because it is designed to power free. It is also very light (compared to powered machines) and so offers a great deal of portability. 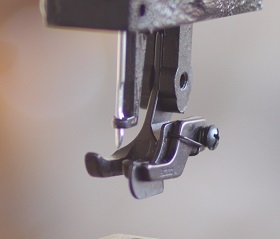 The hand-powered OUTLAW leather hand stitcher can easily be mounted or clamped to any surface and a simple pull of the handle is all it takes to start stitching. Every pull completes a precise lockstitch, so precision step-by step stitching becomes reality for detailed sewing work. This machine is an excellent machine for doing repairs on leather goods that have already been sewn, as the operator can match each hole stitch for stitch. It is also an excellent machine for knife sheath and holster makers. The OUTLAW uses the precision Adler 205 style Barrel shuttle hook, race, and bobbin, and has been specially designed for processing extremely thick sewing thread and heavy weight materials. The hook, race, and bobbin for the Outlaw has been previously unused in machines of this type in the past. Far less skipped stitches can be achieved with the Outlaw due to this precision hook, bobbin, and race design. The Outlaw also features a larger bobbin capacity than other hand crank stitchers in its class. 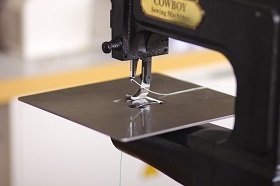 This hand crank leather sewing machine uses a jump foot needle feed mechanism to pull the material through the machine, which results in very consistent stitch lengths, as well as perfectly spaced stitches. Built tough with an extremely durable, precision cast iron frame instead of an aluminum frame, and all steel parts instead of zinc extruded parts, there are no soft metals used at all in the machine. The OUTLAW is truly a rebel in its class!!! Designed to provide years of dependable trouble free operation, the OUTLAW is destined to become a mainstay in your arsenal of leather working tools. 5. Children and young adult safe: Children can easily learn to use, operate, and maintain the Cowboy Outlaw. There is a much reduced chance of injury when using this hand operated machine over motorized machines due to the simple design of the machine. 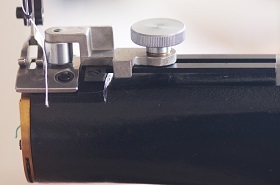 The Cowboy Outlaw also is the only machine in its class to have a bobbin case cover, which protects fingers from getting caught in the hook area of the machine.